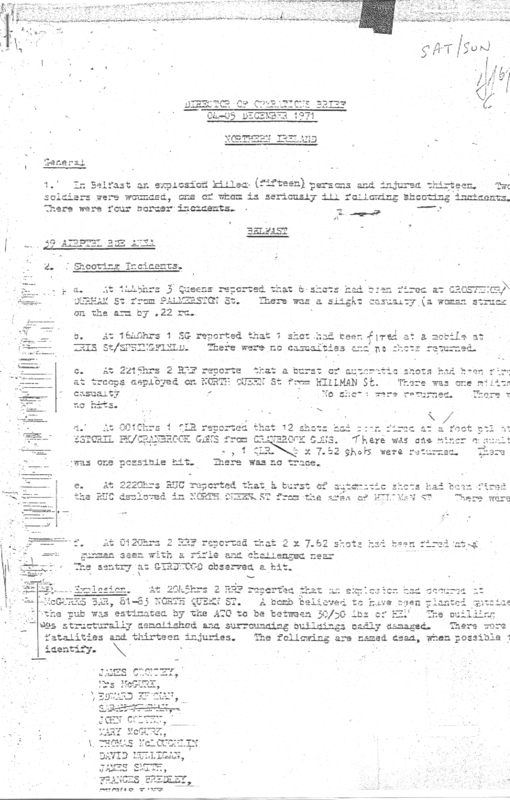 This briefing (Director of Operations Brief for the 4th – 5th December 1971), prepared for Lt. General Sir Harry Tuzo, General Officer Commanding of the British forces in the north of Ireland in late 1971, is a breakthrough document for the families of the innocent victims slain or injured in the McGurk’s Bar Massacre. “A bomb believed to have been planted outside the bar was estimated by the A.T.O. to be 30/50lb of HE (high explosive)”. This is diametrically opposed to the lies that the British military, the RUC and cabinet ministers spun in the wake of the slaughter. These smears abased the basic Human Rights of our innocent family members. These smears purposefully and wilfully channelled a flimsy police investigation away from the true culprits, negating dozens of eye-witness accounts. These smears formed the backbone to British army collusion with their loyalist counter-gang and the foundation to a premeditated cover-up. This document lays these lies bare. The British military’s Information Research Department (PsyOps) is now squarely in the frame for managing the disinformation from this point onwards. The bomb may have been placed in or at the doorway of the family pub, but not within the bar area as their black propaganda would have had the world believe. This document proves, without a shadow of a doubt, that they knew that too as they scripted their lies. Therefore, specifically, we demand that Hugh Mooney (Information Advisor to the General Officer Commanding), the General Staff Officer known to the Bloody Sunday inquiry as INQ 1873 and Colonel Maurice Tugwell of the General Staff are questioned. Few other persons would be better placed to tell us about the information policy of the British army and government at this time. We once more demand that the British government and MoD release all the documents and information they have concerning the massacre. We further demand that the British government gives the victims and their families the closure that only truth will bring and an unequivocal apology for collusion and cover-up. Otherwise, we demand a truly international, transparent and accountable inquiry with powers of subpoena. We cannot trust the agencies or mechanisms the British have in place to re-investigate what we believe was a British war crime.